Another profitable market which Lotus never satisfactorily penetrated was Japan. As part of the engine deal, lsuzu was to market the Elan in Japan, unfortunately they saw it as an Mazda MX5 rival and wanted to price it as such whereas Lotus wanted to pitch it against the more costly Porsche 944 cabriolet. The impasse was never resolved and Lotus lost out on yet another potential profit earner. 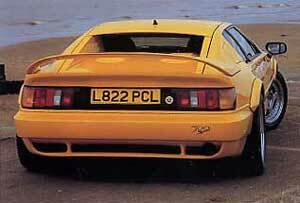 By the end of 1991 Lotus had built a further 2060 Elans, still a third short of the production facilities potential. To compound matters, the bottom had dropped out of the super sports car market and just 125 Esprits had been built. 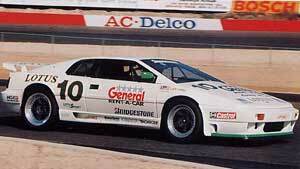 In an effort to revitalise the ageing supercar, the Esprit was repackaged for 1992. After years of customers and the press complaining about the Esprit’s cramped interior and narrow-opening doors, Lotus redressed the problem. Some clever redesigning resulted in seats over two inches wider, a slimmer central tunnel gave more elbow and passenger space, a re-designed bulkhead added 1.4ins to the cockpit length and a new pedalbox increased foot-well space. A new hingeing system saw the doors open a further 15 degrees so passengers and drivers could at least get in and out of the car-without performing circus-like contortions. Externally, the car came in for a minor facelift with the deletion of the glassback rear window and, for the SE only, a new rubber lip on the front bib and revised engine bay flow. Most controversially of all there was a high-mounted rear wing to compensate for deleting the old smaller spoiler and the sloping rear window. It might have increased the car’s top speed to 165mph and reduced its Cd to 0.33 and the whole aerodynamic package might have resulted in virtually zero lift front and rear, but that wing was possibly the ugliest appendage ever put on a car and totally out of place. 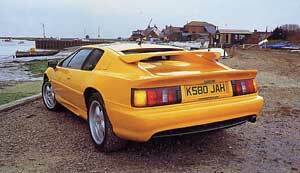 Just the chargecooled SE model was offered with the device, the only other Esprit now on sale being the 215bhp Esprit. At the same time Lotus announced a hardtop for the Elan. Featuring a double-skinned composite construction, a heated rear window and an interior courtesy light it was scheduled to go on sale the following year, but none were ever sold to the public. Once again it looked as if Lotus had snatched defeat from the jaws of victory. A global recession, luxury taxes imposed on imported cars in the USA, a failure to secure a distribution deal in Japan and, above all, the Elan was an impossibly complicated car to build that was always going to be marginal on profits conspired against Lotus. But such worries shouldn’t have concerned Lotus, tucked safely as it was in the bosom of GM. What were a few losses to the world’s mightiest car corporation? The amount of money Lotus was losing must have been the equivalent of gnat’s blood compared to the amount of red ink that must have filled GM's accounts; in 1991 in made a vast $4.5 billion loss, at the time the biggest in corporate American history. Apparently it did concern Lotus and once Bob Eaton — Lotus' fairy godfather within GM for so many years — had unexpectedly quit in March '92 to become chairman of arch-rivals, Chrysler. The accountants' writing was on the wall for Lotus and it didn't take long for the Detroit beancounters to make a decision. At the beginning of March, Adrian Palmer — Lotus' new MD in the wake of Kimberley's departure to new GM pastures in the Far East — announced that all car production at Hethel would stop for five weeks and that the Excel, now in its eighteenth year, would be dropped altogether. However, on Monday June 15 1992 the inevitable happened: the Elan was killed off, just 30 months and 3,857 cars after it had been launched. The signs had been posted earlier in the year when the decision was taken to cut back Elan production to 2000, but even that and a midnight oil project to take cost out of the Elan failed to save one of the world's greatest sports cars. Matters could only get worse for Lotus, and did, when GM announced that just 950 Lotus Carlton/Omegas would be built — 150 short of the predicated run — and that production would finish at the end of 1992. So, in 12 months, Lotus had gone from dizzy heights to the dismal depths of despair and Hethel, once buzzing with new jobs and unbridled enthusiasm, was more like a ghost town with two dormat production facilities, the Elans and the Lotus Carlton/Omegas. It would be difficult to imaginee matters getting much worse at Hethel, but they did as 1992's Esprit production was a meagre 173 and none were built for the US market. The questions that lingered on everyone's lips were simple: could Lotus survive; moreover did GM want Lotus to survive? Doom and gloom might have been the prevailing atmosphere at Hethel, but they were putting on a brave face. 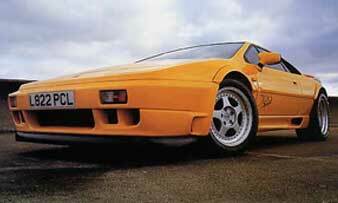 At the 1992 Birmingham Motor Show, Lotus displayed a concept version of the Esprit. Based on the Esprit X180R race version which had been enjoying considerable success in the American Supercar Championship with Doc Bundy winning the Driver’s title, the Sport 300 featured a tuned version of the 2.2- litre engine producing 300bhp achieved by reworking and porting the cylinder head, using a hybrid Garrett T4 turbocharger, larger injectors, a bigger chargecooler and linking the airconditioning radiator into the chargecooling system to increase its efficiency. Extensive use of composites shaved 250lbs off the bodyshell, complete with wheelarch extensions and — thankfully — a neater rear wing arrangement. The chassis was stiffened, bigger — 13ins front and 11 ins rear — brakes used, gorgeous OZ three-piece alloy wheels (8.5x I 6ins up front and bigger, 10.5x 11ins at the back), specified and shod with equally impressive 245/45x 16 and 315/35x 17 Goodyear GS-C tyres. While the suspension was heavily revamped with new geometry settings to give more grip and balance as well as modifications to the top links, bushings, damper and spring rates. At its launch there was vague talk of production, but nothing concrete. In fact most people wondered if Lotus would survive into the following year. The question was partly answered in February 1993 when the Esprit S4 was launched. From a distance it might have looked like its forebear — thankfully with a neater flying wing half way up the buttresses — but close up it was a very different car. Sitting on elegant five-spoke 11ins rims girded by asymmetric Goodyear Eagle GS-A tyres (215/40 on 7J rims at the front and 245/45 on 8.5J rims at the back), the new Esprit boasted a revised front spoiler which recalled the original Elan’s air intake, new side skirts, door skins, front and rear bumpers and subtle changes to the ‘A’ pillar, engine vents and bonnet. At last, the Morris Marina door handles which had blighted the Esprit since its birth were abandoned in favour of flush Rover 200-sourced body-coloured units. Once inside, there was evidence of more GM componentry: electric window and mirror controls, door handles and stalk controls; it makes you wonder why it took Lotus, and GM, so long to dump the Esprit’s old switch gear which always detracted from the car’s best features. Carbonfibre now decorated the facia in place of wood veneer and a fresh, chunky Nardi steering wheel topped a new steering column. 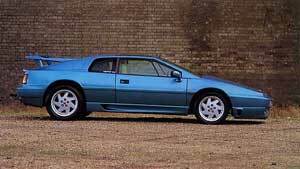 Fortunately Lotus had the good sense to realise that that wing wasn’t making the marque any new friends and in early 1993 launched the Lotus Esprit S4 as the only version of the mid-engined two-seater offered. The very subtle, but extensive re-styling has freshened up the car’s looks and marginally improved leg, head and shoulder room for driver and passenger. 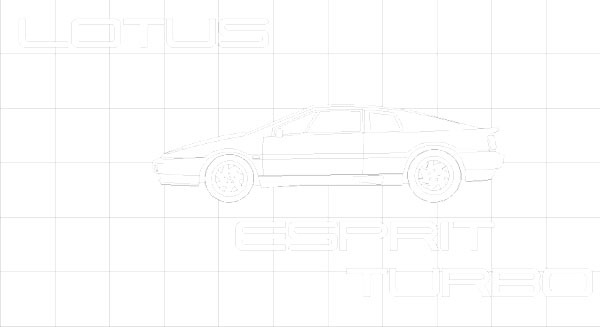 Left picture: The restyled Lotus Esprit S4. Right picture: The interior, though finished in sombre grey is roomier; GM and Rover sourced switch gear has replaced the out-dated components’~ that was once used. However, what the steering column was attached to was important. For the first time Lotus fitted power steering to its mid-engined supercar Gone forever were the muscle-building efforts required to park an Esprit. It took Lotus two years to develop the Saginaw system for Esprit and it demanded subtle changes to the front suspension geometry as well as a new anti-roll bar, springs and dampers to work effectively. The 2.2-litre engine maintained its 264bhp output, but all-new head, block and sump castings increased stiffness, a more durable cylinder head gasket was employed and the engine management system re-mapped to give more torque at lower revs. A revised high-torque version of the Renault gearbox was also used. In profile, the Esprit is little changed save for a deeper front bib, air ducts for the front brakes, scalloped air scoops cut into the sills, and twin wings at the back — the flying bridge and ducktail lip obviate the need for the glassback hatch. Still, it was going to be a rare car; Lotus announced that only 300 Esprit S4s would be made in 1993 plus a further 50 Sport 300s. Surely, not enough to keep Hethel running as a viable producer? Ten days after the S4’s launch — 24th February — the news leaked out that Lotus was up for sale. GM tired of supporting the company, and with a new management team at its head determined to bring the American giant back into profit, were off. What everyone had known would happen when the Elan was killed off, but had been afraid to admit, had become reality: Lotus was back on its own. Managing director, Adrian Palmer tried manfully to put a management buy-out together, but it was never really on. City investors had been burnt too often in the past with specialist car producers and in 1993, when the market for luxury sports cars was at its lowest, there was little faith in Lotus. A chequered history, which had seen Lotus stagger from insolvency to crises and back again, can’t have helped Palmer’s cause. GM had, at least, performed one honourable act and that was to right off Lotus’ £54 million debt, so any new owner would have a clean balance sheet — but they would need tens of millions to finance a new product range. As Palmer and his team struggled to get the financing, things deteriorated further when 70 employees were made redundant in early summer 1993 as orders for cars and, crucially, consultancy work for Lotus Engineering started to peter out. Even Touche Ross, Lotus’ auditors, were openly questioning the marque’s long-term viability when an unlikely saviour appeared on the horizon — Bugatti. The legendary French marque had been revived in I 990 by Romano Artioli — a wealthy Italian entrepreneur and car enthusiast who counts amongst his business interests the Lotus franchise in Italy — and a group of mystery backers. Artioli had long been an admirer of Lotus Engineering’s technology — especially its Active Suspension and Adaptive Noise Control know-how — and ownership of Group Lotus (excluding Team and the Millbrook Proving Ground), would give Bugatti instant access to that technology. Rumours also abounded that there were bids in for the mothballed Elan production line, including proposals from a number of Far Eastern consortiums and Kia, the South Korean car producer. However, by the end of August all was settled and Bugatti had bought Group Lotus from GM for an undisclosed sum, rumours maintaining that it was £30 million. As this is being written Bugatti’s plans for Lotus are unknown: there is talk of an Esprit replacement, a contemporary Lotus 7 and, possibly a modern version of the 2+2 Excel. (The editorial office at Osprey know a thing or two, but are sworn to secrecy at the moment.) The only concrete news is the Elan’s return. When Lotus ceased producing the front-drive supercar, it held in stock some 800 lsuzu powertrains. That, together with GM’s decision to wipe out all of Lotus’ debt, meant any new owner could put the car back into production for very little cost, but maximum profitability. Artioli and Palmer confirmed that the ‘Mark II’ Lotus Elan would be in production in mid-I 994, with only minor changes over the original, including minor interior revisions and upgraded suspension with stiffer springs and bushes, bigger I 6xlins wheels with 205/4SZR — 16 tyres, while the doors would be updated to incorporate the latest side-impact technology Its sale price, according to Palmer, should be near the £22,750 tag the original Elan SE carried when it was withdrawn from sale. So, as this book closes, a new chapter in Lotus’ varied history opens. Motoring enthusiasts, especially Lotus owners, will fervently hope that the men and women who are now guardians of the ‘ACBC’ logo appreciate just what it is they possess, and that they have learned the lessons of history. After all, we all thought Lotus had been saved when David Wickens and company acquired Lotus, then we all knew Lotus had been saved when GM swept in. Perhaps, with Bugatti, it will be third time lucky. I hope so. Though if any company’s history indicates that nothing is certain and that white knights sometimes give up if faced with too many dragons, it is the history of Lotus.